LEVELLERS – Hull Zebedee’s Yard show cancelled this weekend. No band ever likes to cancel a show , but health comes first. Get well soon Mark! short notice cancellation of Levellers show in Hull on Saturday July 28 and at the Y Not Festival on Sunday July 29 - due to frontman Mark Chadwick falling ill.
"Sadly we are going to have to cancel our shows this weekend - in Hull on Saturday, and we will not be performing at the Y Not Festival on Sunday. Mark Chadwick is unwell and it’s become clear over the last 48hrs that he needs more time to recover - he will not be well enough to perform this weekend. Refunds will be available from your point of purchase for the show in Hull, we are not able to reschedule the date. Thank you for your understanding, apologies from us and we’ll let you know as soon as we have any further updates. 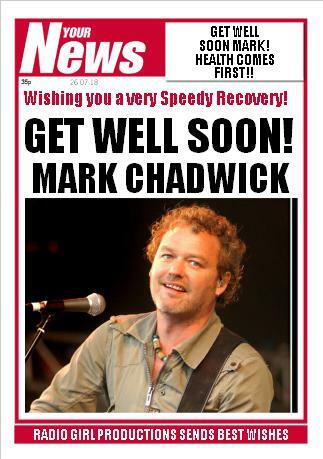 x"
From all of us at InnerCityLive & VMS Live we wish Mark all the best and speedy recovery. As a result of the cancellation of their appearance by the Levellers on Saturday July 28th at Inner City Live in Hull we are unfortunately cancelling this event and ticket refunds will be made for ticket holders from point of purchase, however, if you would prefer tickets for any of our future Inner City Live events in August for shows with the Happy Mondays & Peter Hook & The Light (August 24th) or The Wombats & The Rifles (August 26th) please contact your ticket agent, these tickets are subject to availability and any variation between the face value of each ticket will be need to met by the customer. I started out as an actress ,had years of dance training, been an occasional singer and even did some some occasional modelling before accidentally falling into radio &; voice-overs. I have been fortunate enough to have interviewed a wide variety of people over the years including Brian May (QUEEN), Ian Paice, (DEEP PURPLE ) Mr James Brown, (R.I.P) Jon Stevens ((NOISEWORKS / INXS )), Wilko Johnson,, Garry Christian (The Christians), The Parlotones, Dave Dobbyn, numerous cast members from the hit tv soap Neighbours , Mollie Marriott , , The Proclaimers, Ian Brodie (Lightning Seeds), , members of Magnum, Bill Leverty (Firehouse), Sandi Thom, Steve Harley, Glenn Tilbrook, Michael Franti, Styx, various members of Big Country, Mike Peters, (The Alarm) Martha Reeves, Hazel O'Connor, Suzanne Vega, Dorothy Moore, Stevie Lange, James Blunt, Orianthi, Jools Holland, Dr Hook, Rick Wakeman Brian Ray , Tony Butler and MANY many more! Find me on Twitter via @RadioGirlProds Hear me on Classic Rock Radio as well as doing guest slots and features at various other radio stations.